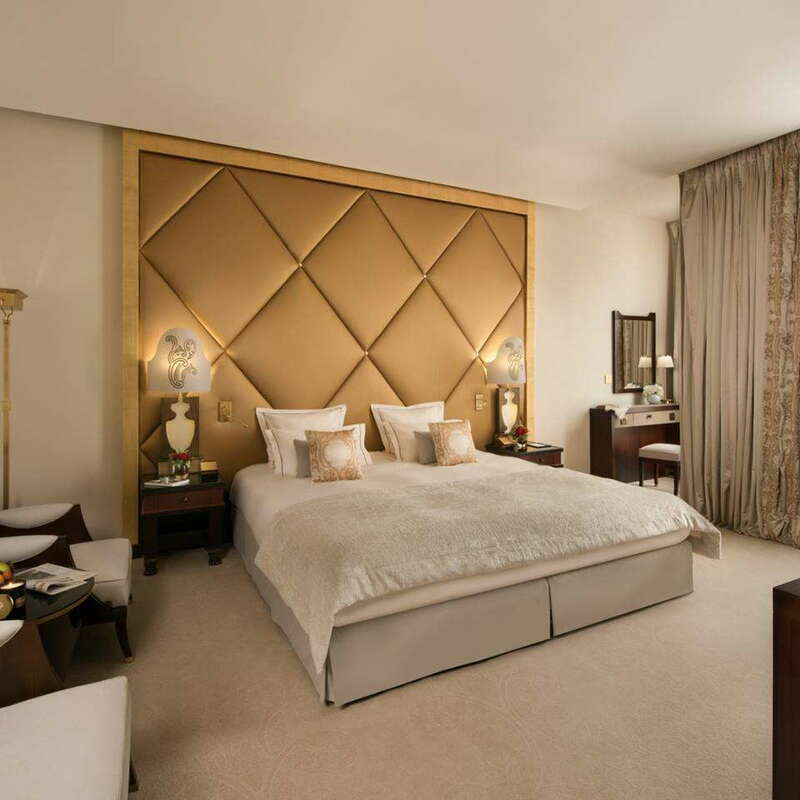 Steps away from one of the world's most famous avenues, this newly spiffed up luxury hotel, adjacent to the legendary Fouquet's Brasserie at the corner of the Champs-Élysées and Avenue George V, is recognizable by its uniformed valets, parked sports cars, and elegant Haussmannian entryway. Also appreciated for its peaceful garden courtyard, views of the avenue, generous pool, and chic bars, Fouquet's is a Paris institution. YOU SHOULD KNOW Be aware that the hotel will still be under renovation till the end of 2018, but assures that guests will be none the wiser. For this stylish renovation, designer Jacques Garcia veered away from his usual boudoir-like decor (which you'll find in the Marta bar) in favor of highly refined "Empire"-inspired interiors, featuring a muted palette of dove grey and taupe punctuated with burnished gold or bronze, sleek mahogany, plush carpets, and luxury fabrics. 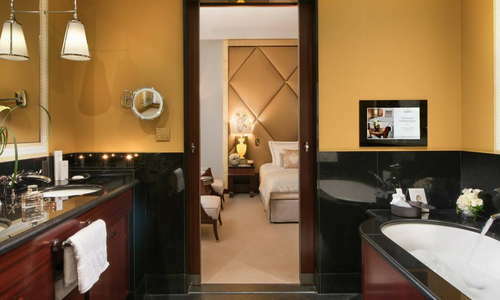 Rooms are much larger than the Paris average, and some offer stunning views down the Champs-Élysées or the Eiffel Tower. Some rooms with upper-floor terraces offer views all the way down the avenue, a stunning scene at night. 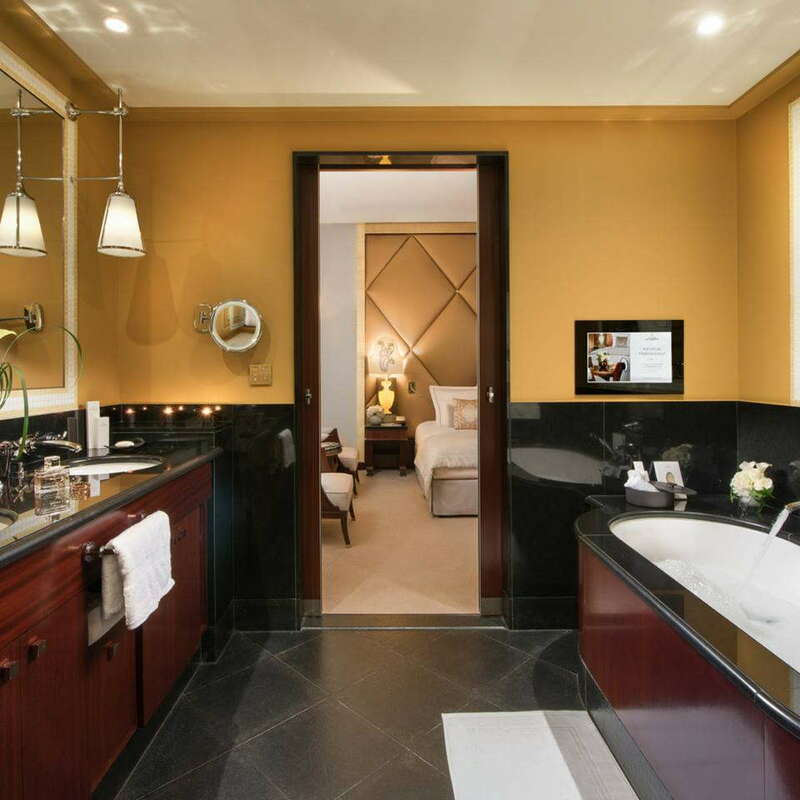 Glamorous, generously proportioned baths are done up in chic black and gold, with luxury fixtures, mirrored TVs, huge baths and walk-in showers, heated floors, and luxury bath products. Past the reception area you'll find a series of small lounges connected with the various bars and restaurants, plus the first-floor garden terrace. All of which are open all day and some well into the night. The 15-meter pool—one of the largest in a Paris hotel—and "acqua circuit," with bubbles and counter-current, are a big draw for this hotel. The Diane Barrière spa offers five treatment rooms, including a double, and all the luxury beauty and wellness treatments you would expect, plus a hair salon, steam room and sauna. Part of the spa, the well-equipped gym offers all the latest equipment, plus free water, drinks, and snacks, a steam room and a sauna. 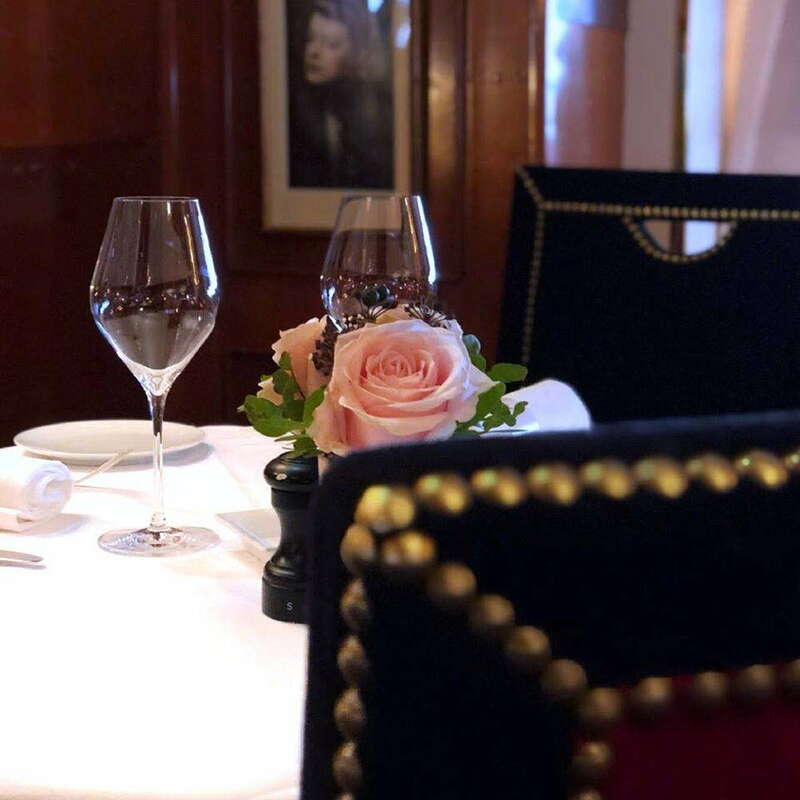 Most famous for it's sophisticated 19th-century brasserie (now with an updated menu of French classics by Michelin-starred chef Pierre Gagnaire), you'll see photos of all the luminaries who've dined here, from Marlene Dietrich to Nicholas Sarkozy. Le Joy gastronomic restaurant offers a softer atmosphere than the panelled, time-burnished brasserie, and access to the spacious garden terrace, for lunch and dinner. 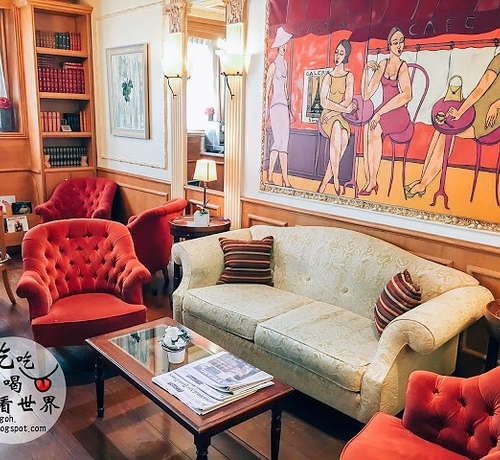 Locals and guests alike flock to the three hotel bars, the brasserie's sophisticated L'Escadrille, refined Le Joy bar, and the gorgeously opulent Marta, where Garcia worked his usual magic. Or you can dine or drink on the sidewalk terrace for some excellent people-watching right on the avenue. Expect weekend DJ nights at L'Escadrille and Marta, when the chic locals descend. A two-minute walk to the George V metro station serving line no. 1, Paris's fast central line, and five minutes from Saint-Philippe-du-Roule, which takes you direct to the Trocadéro. This is an ideal area if you want to in the thick of the action on the Champs-Élysées, close to transport and elegant shopping. Here you're in the heart of the Golden Triangle, with some of the city's most glamorous shopping—Louis Vuitton is across the street—and within easy walking distance of the rue Saint-Honoré, another shopping hotspot. You're also an easy walk to the Tuileries gardens and some of Paris's great museums, including the wonderful Grand Palais and Petit Palais, L'Orangerie (home of Monet's most famous Waterlilies), Jeu de Paume photography museum, the Louvre, and the Musée des Arts Décoratifs. 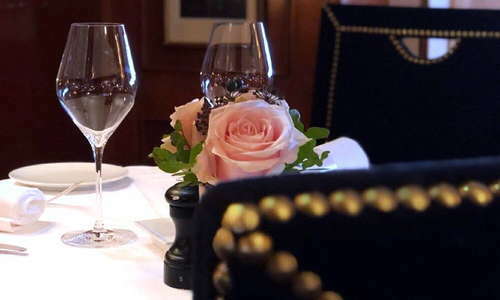 Some of Paris's greatest gastronomic restaurants—mostly in other hotels—are an easy walk away, including Le George, at the Four Seasons George V, La Scène, at Prince des Galles, Alain Ducasse at the Plaza Athénée, and their wonderful Art Deco bistro Le Relais Plaza with its popular Wednesday jazz nights, Epicure at Le Bristol, and Ledoyen, Paris's oldest and arguably most romantic restaurant (Napoléon met Josephine there), to name a few, all within a 5-15-minute walk. If these exceed your splurge fund, three-star chef Eric Frechon of Le Bristol designed the menu at Mini Palais, housed in the Grand Palais, whose all-day and late-night hours and outdoor terrace make it a neighborhood favorite (10 minutes by foot). 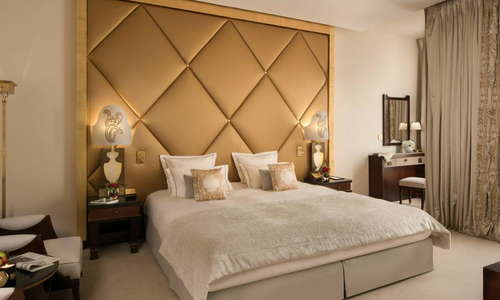 If the hotel's three bars aren't enough, you can head over to La Réserve's opulently stylish and cozy lounge, also designed by Jacques Garcia; the superb Art Deco Les Heures at the Prince des Galles, and the newly opened Hôtel de Crillon's Les Ambassadeurs, hands down Paris's most stunning bar. But Mini Palais is a your go-to place for a more reasonably priced cocktail. We liked it before the renovation and we like it even more after. Though not a palace hotel, it has pretty much everything you'd find in one, including a pool, butler service, liveried attendants, and a storied history, plus a lively, unpretentious atmosphere.